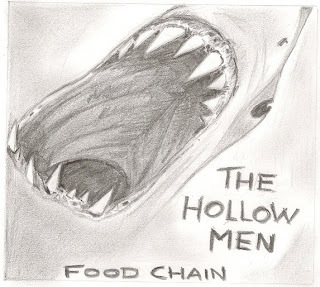 "The Hollow Men were founded in 2001 by four music lovin' friends from the Dutch towns of Goes and Zierikzee and raised on a steady diet of Heavy Metal, Punk, and Classic Rock. They played their first shows as "The Speed Kings" but since there are a bunch of other bands and artists with similar names they rapidly changed it into "The Hollow Men" [after their first self-written tune]. Two demos were released, despite the fact that they're both clearly recorded with no budget to speak of. The reactions in the music press are mostly positive. Comparisons have been made with Hüsker Dü, Screaming Trees, Queens Of The Stone Age, Foo Fighters, and Entombed. A very big and well-known Dutch Rock & Metal-magazine even calls 'em 'potentially' the new Aerosmith(!!?). Many shows are played, including supports for some of their heroes like Peter Pan Speedrock, Dead Moon, a mini club tour with NWOBHM legends Diamond Head, and even a gig at Antwerp State Prison."